Join us for an entertaining and informative seminar on how to improve your bird and wildlife photography skills. Local photographer Gary Whiting will share practical tips and actual examples to help you regardless of your skill level or the type of gear you use. His programs are a result of 30+ years of photography experience combined with naturalist training and years of wildlife behavior observation. Not a photographer? You’ll still enjoy the beautiful images and an entertaining presentation. Gary Whiting is a freelance photographer, instructor, and naturalist specializing in wildlife, landscapes, and adventure images. His work has been featured in Bird Watcher’s Digest, St Johns Magazine, Wild Birds Unlimited retail video and social media, and various local businesses and publications. He teaches photography in private sessions and in groups at the OLLI continuing education program at University of North Florida. He is also a Florida Master Naturalist and a sales consultant at Wild Birds Unlimited in Fruit Cove, Florida. February 20th @ 6:30 p.m. for refreshments followed by the presentation at Swaim Memorial United Methodist Church, 1620 Naldo Ave., Jacksonville, FL. In celebration of Asa Wright Nature Centre's 50th anniversary, they are offering to donate $100 to our chapter when anyone books a trip to Asa Wright Nature Centre in 2017 through Caligo Ventures. They offer guided group tours, independent birding ventures or relaxing lodge stays. 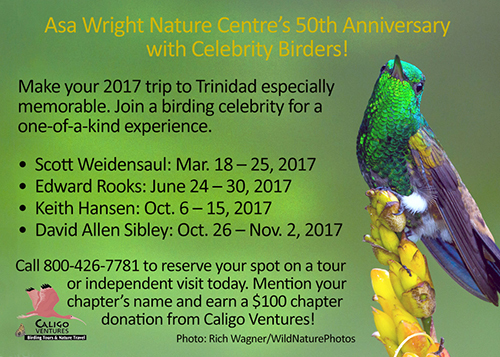 They are having special anniversary tours featuring 'birding celebrities' throughout the year. You can go during one of those weeks or anytime during the year. Just remember to mention you would like the donation to go to Duval Audubon Society. For more information on booking your trip, go to caligo.com. Great Backyard Bird Count February 17-20th! The Great Backyard Bird Count (GBBC) is an annual four-day event that engages bird watchers of all ages in counting birds to create a real-time snapshot of bird populations. This year the count will take place from Feb. 17 – 20. Participants are asked to count birds for as little as 15 minutes (or as long as they wish) on one or more days of the event and report their sightings online at www.birdcount.org. Anyone can take part in the Great Backyard Bird Count, from beginning bird watchers to experts, and you can now participate from anywhere in the world! This year we are offering an organized field trip for the GBBC on February 19th. It will be at Cedar Point Preserve, 7116 Cedar Point Road in Jacksonville, so join us for that as well. It's free, fun, and easy. Each checklist submitted during the GBBC helps researchers at the Cornell Lab of Ornithology and the National Audubon Society learn more about how birds are doing, and how to protect them and the environment we share. Last year, participants turned in more than 144,000 online checklists, creating the world's largest instantaneous snapshot of bird populations ever recorded. Road Show of 2016's Avian Photography Coming This Month! Mark your calendars! Visit the Wild Birds Unlimited Store, Julington Village in Fruit Cove between February 24th and March 4th and the Jacksonville Beach store in the South Beach Regional Shopping Center at the beach end of Butler Boulevard between March 6th and March 16th to walk among the winning bird photographs from this year’s Audubon Photography Awards and learn more about your local birdlife. Selected from over 7,000 entries—submitted from all 50 states, DC, and Canada—the winning photos were published in the May/June 2016 issue of Audubon magazine. A panel of five judges had the daunting task of sifting through the stunning images and grading them based on technical quality, originality and artistic merit. The St. Johns County Audubon Chapter will be hosting a reception at the Fruit Cove store on Monday, February 27 @ 6:30pm to highlight these photos, provide information about the local chapter and its activities, and provide advice on nature photography.